As I continue with this series of posts on crevicing or gold "sniping," please bear in mind that the post's title is not targeted toward large-scale or commercial mining enterprises, but is oriented toward you, the individual gold prospector and miner. That said, let's move on and talk about dry placer crevicing a bit more. I mentioned in my previous post that the main advantage to crevicing dry placer locations is accessibility. This is due primarily to the lack of water in most desert or dry placers...a two-edged sword when it comes to crevicing and small-scale gold mining in general. Lack of water. A friend and an enemy of sorts, the absence of water in dry placer bedrock areas severely restricts your ability to sample properly. Sure, you can dry pan material (a very inefficient way to pan or sample, by the way) but in certain instances once you start rooting around in dry placer bedrock crevices, chances are some of that material is going to come up damp. When this occurs, you either have to dry that creviced material out and run it through a dry washer, or get it to water (wash tub, water recycle unit, etc.) to pan it or process it properly. Poor gold visibility. The pure and simple fact is that most creviced gold doesn't show up well in all that sand, dirt, gravel, and dusty grit that typify the majority of dry placers. This is especially true of the finer or smaller pieces of dry placer gold. Large or medium nuggets are a rare event in crevicing in general, so don't expect to be able to easily "eyeball" big, gleaming pieces of placer gold in creviced material from dry placer bedrock. (If this does happen, however, you're in fat city my friend.) 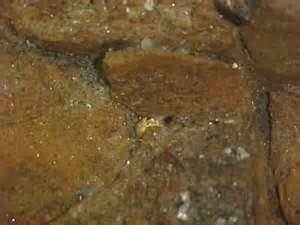 By contrast, in crevicing underwater placers, you can spot even very small pieces of placer gold resting atop bedrock or crammed into a crack or crevice in most instances. Erratic or "spotty" gold deposition. 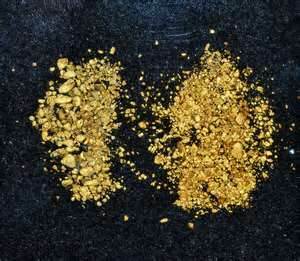 Although not a factor in each and every case, gold deposition in dry placer areas tends to be very hit or miss. As I mentioned before, this is due primarily to the intermittent flow of water in most dry washes, gullies, or arroyos in dry placer districts. So that bedrock crack or crevice you just spent 30 minutes cleaning out may, or may not, carry any gold. Remember this fact...it'll save you some heartache and frustration. Still, you must approach each likely looking dry placer bedrock crack, crevice, or depression with the same care and level of effort you would anywhere else, wet or dry. A reasonable number of you out there have e-mailed me to ask about the role of "Dry Vacs," "Shop Vacs," and gold metal detectors in dry and wet placer crevicing. You're a step ahead of me and I'll get to those items when I discuss the tool and equipment factors involved in crevicing and gold "sniping." So be patient and I'll get there eventually. Best of luck to all of you and keep coming back. I depend on your support. If you liked this post, you may want to read: "Crevicing Still remains One of Your Best Gold Recovery Methods (Part 2)"
Jr would this be true on mountain sldes. Areas where runoff would also be intermitent. In a gold bearing area. In areas of ancient volcanic activity.Or would the water just run off too fast. Being mostly rock. And just collect in the streams below. Would this just be a waste of time. Checking these areas out. Yes...it's good to crevice anywhere there is exposed or shallow bedrock. As you rightly point out, some areas where wet placers exist so do dry ones...dry gullies or intermittent or seasonal only flow creeks, etc. However, in wet placers I've found feeder streams to be either very good or very bad. Always worth checking though. Best. J.R. Thanks JR new to Prospecting.I thought this might be worth trying. Just need some time. Dry crevicing does sound easier then wet crevicing. Like most things in this life, each has its own advantages and disadvantages. Again, never hurts to try your hand when bedrock is available and not buried under massive overburden. Best! J.R.